Magnolia Magnolia is a friendly and reliable florist that has over 20 years of experience in the business. With a passion for flowers, Beverley and her team of accomplished florists pride themselves in creating wonderful and innovative designs for every occasion. Weddings At Magnolia we understand the importance of every wedding being unique. With this in mind every bride is given as much time as needed to discuss in detail their particular designs and requirements. From bridal bouquets to buttonholes we endeavor to help you choose flowers and colours to compliment your theme. The same applies to the church and reception flowers where we are happy to meet at the venue to discuss following through with style and colour. Funerals Whether a parent, friend or partner, losing somone can be very sorrowful and a particularly difficult time for the bereaved. 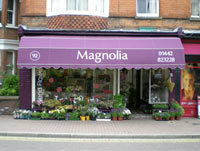 Magnolia is a friendly and reliable florist that has over 20 years of experience in the business. With a passion for flowers Beverley and her team of accomplished florists pride themselves in creating wonderful and innovative designs for every occasion.